Hawk Hill’s fences are draped with heavily scented honeysuckle vines, humming-bird enticing trumpet vines, and deep emerald toned Virginia Creeper. Unfortunately, these vines which so perfectly provide a thick cover of privacy at each of the property lines also peep up invasively at all points not mowed regularly, including my flower beds. I’ve spent years weeding flower beds religiously, and other years simply giving in by mid-june and surrendering to the never ending tide of vines re-claiming my flower beds. This year, I got smart and decided to outsmart the vines by not merely weeding, but by trimming and precise application of strong herbicides. I brainstormed methods to apply herbicide precisely with one hand (so the other could hold and use a pair of hand pruners) and came up with the idea illustrated below. 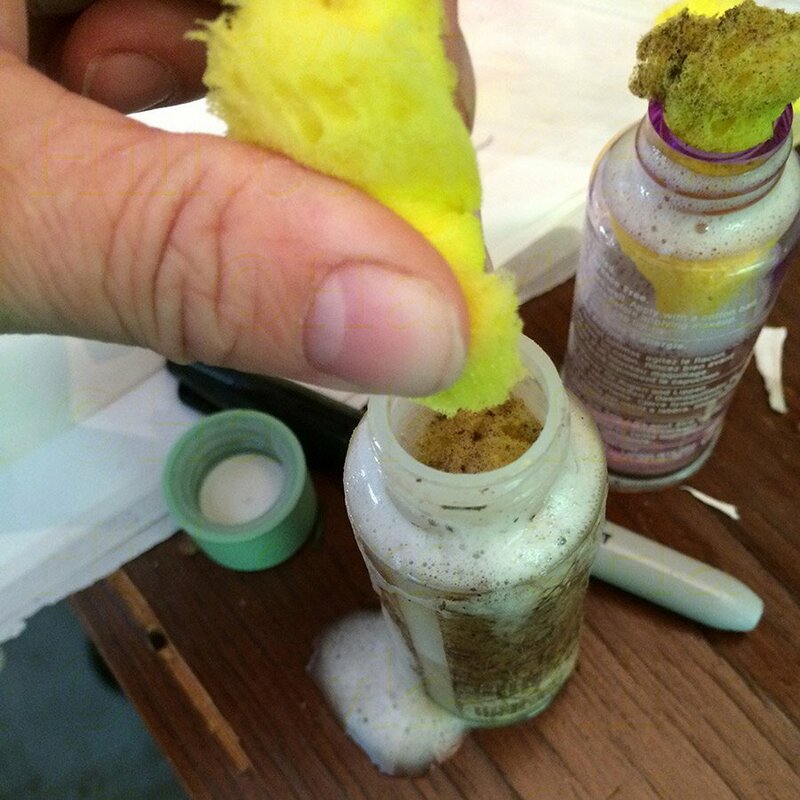 I’ve made my own sponge tip applicator, but you can buy a sponge-tip applicator bottle which should work as well or better than the DIY bottle below. 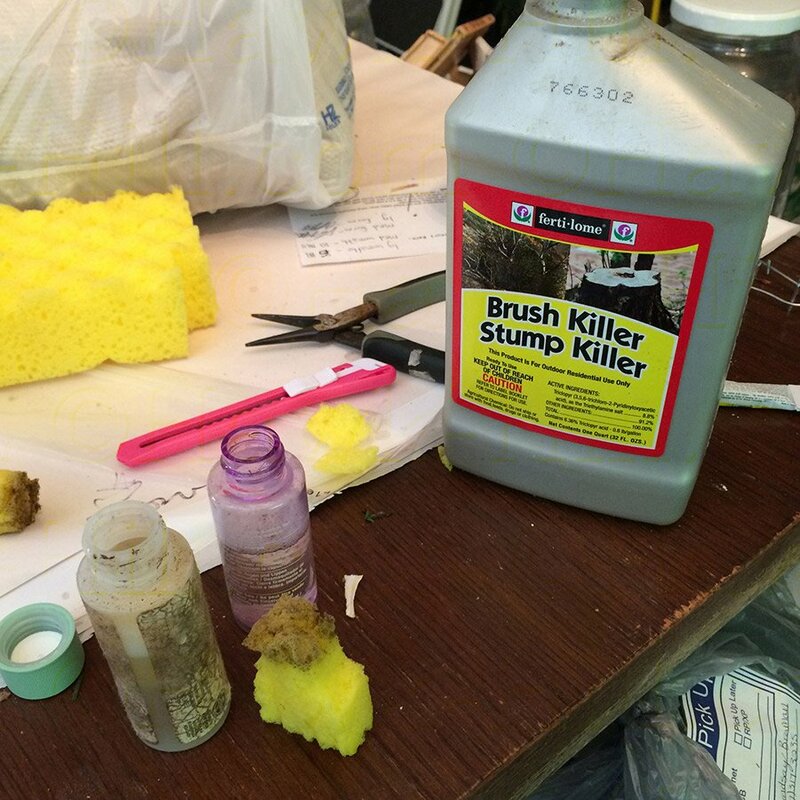 Applying a strong herbicide to the cut where a weed was trimmed ensures that the pesticide penetrates the plant’s system so the weed will not grow back. 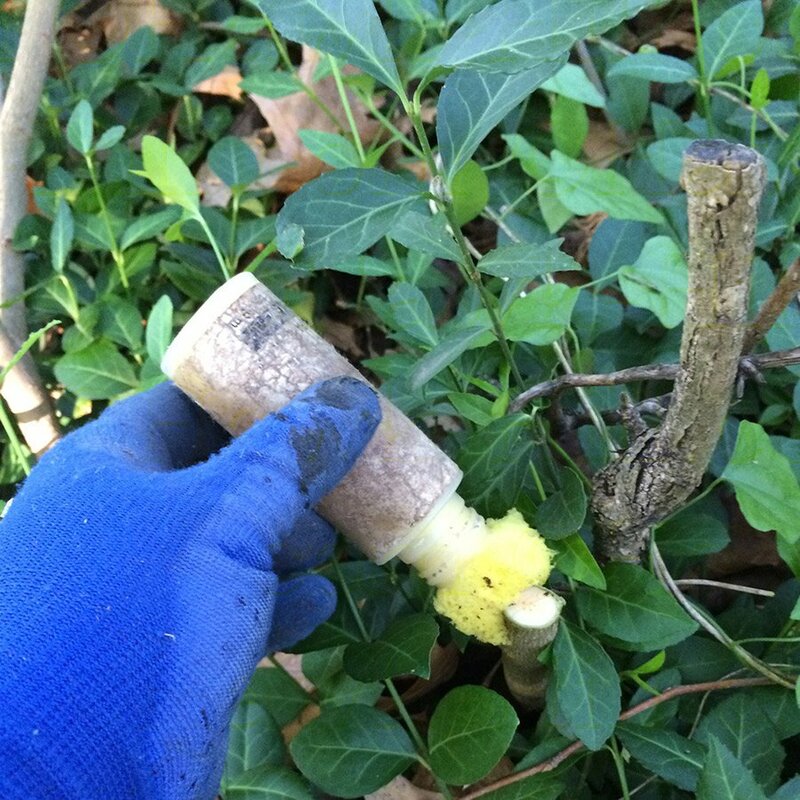 This is particularly helpful in killing off vines with underground runners and perennial weeds. This method ensures my weeding has long term, not just short term benefits, and the precise application of herbicide means I can use as little chemicals as possible to get the job done. 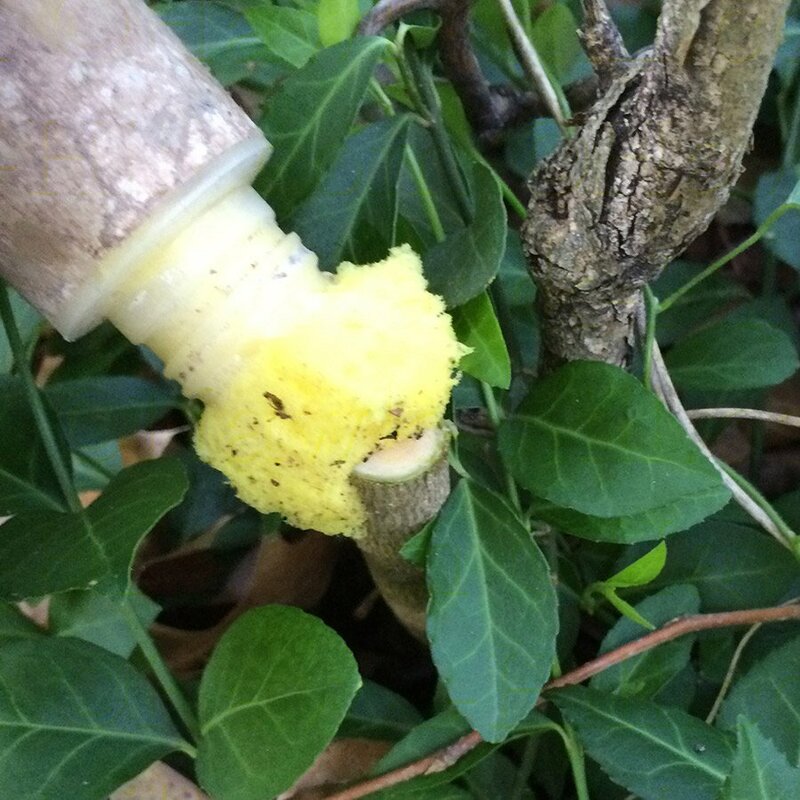 I use Triclopyr (usually marketed as stump/brush killer) for it’s ability to kill off very resilient vines like honeysuckle and trumpet vine. 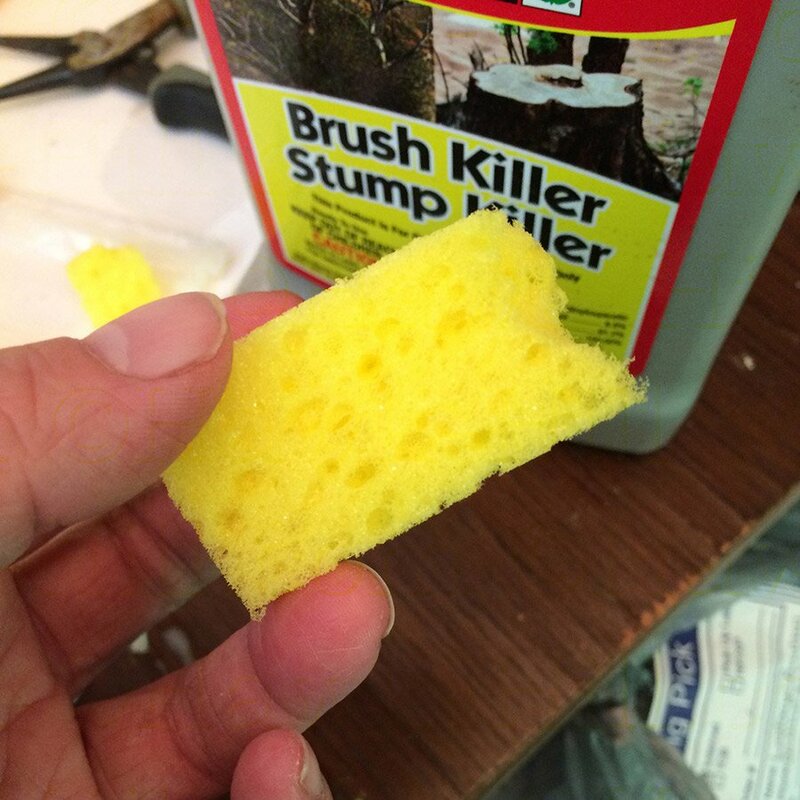 Cut a piece of porous sponge that is about 3-5 times as large as the opening/neck of your bottle. Elm trees like this one are notorious for sending up multiple new trunks each time they are pruned back (you can see the trunk cut back last year, in this photo). 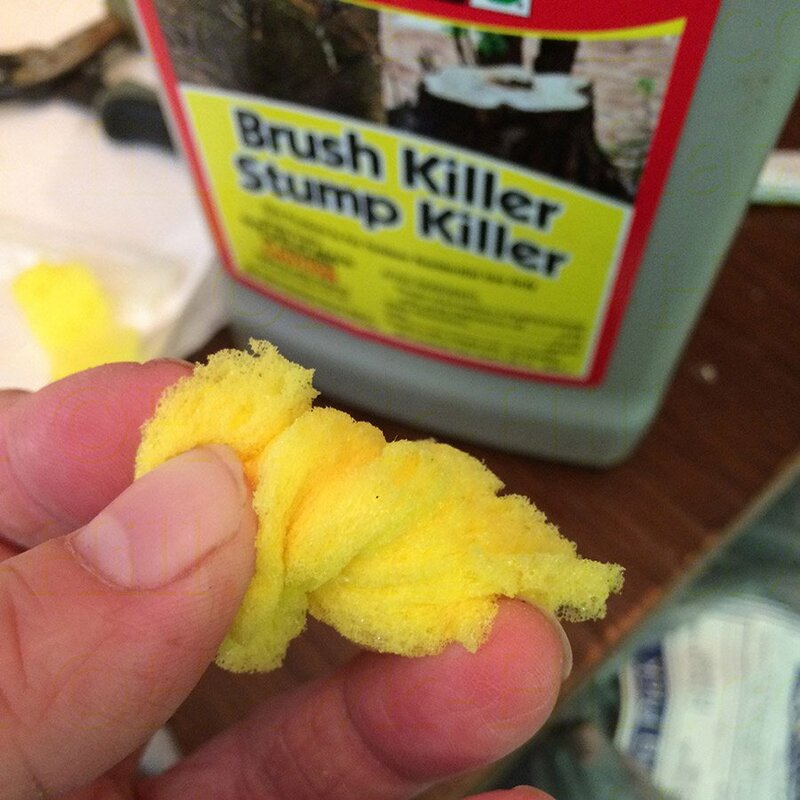 Dabbing stump/brush killer on the freshly cut trunk means the herbicide will penetrate the plant’s system and I won’t have to cut this treat back again and again in coming years.